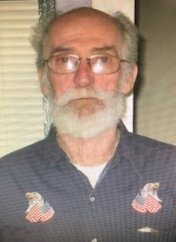 Glenn Lee Robbins, 72, of Litchfield, IL, died at St. John's Hospital on Sunday, March 31, 2019 at 1:19 pm. He was born December 14, 1946, in Litchfield, IL to Clark Junior Robbins & Helen Ruth (Feyen) Robbins. He was a truck driver. Glenn enjoyed fishing and model cars. He is survived by his son in law, Carl Walker of Litchfield, IL, grandchildren, Stacey (Dustin) Wendel of Litchfield, IL, David Hammann of Litchfield, IL, Kayla Hammann of Litchfield, IL, great-grandchildren, Natalie Wendel, Lucas Wendel, Austin Wendel, Bailey Robb, Hunter Lake, brothers, Robert Robbins of Springfield, IL, James Robbins of Jacksonville, IL, Harvey Robbins of San Bernardino, CA, Charles Robbins of Benld, IL, Oscar Robbins of Gillespie, IL, Leonard Robbins of Benld, IL, Terry Robbins of Gillespie, IL, Jerry Robbins of Gillespie, IL, Ronnie Robbins of Wilsonville, IL, sisters, Ruth Robbins Caldieraro of Staunton, IL, Jodie Arnold of Wilsonville, IL, 40 nieces and nephews, 75 great nieces and great nephews and 1 great great nephew. Glenn was preceded in death by his parents, daughters, MaryAnn L. Walker, Sheila Marie Robbins, sons, Glenn Clark Robbins, Richard Robbins, David Robbins and Larry Robbins. A celebration of life will be held at 3pm on Saturday, April 6, 2019 at 816 W. Edwards, Litchfield, IL. Memorials are suggested to the family for great grandchildren's fund. Anyone wishing to send an online condolence may do so at www.kravanyafuneral.com. Kravanya Funeral Home, Gillespie, IL is in charge of the arrangements.